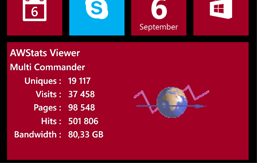 My Windows Phone 8 app for showing AWStats is starting to work now now. The main goal with this app has been to learn the API and how development on Windows Phone 8 works. It was quite easy to get started and get started. It might be because I already know my way around Visual Studio and I already know C# and done some apps in XAML before. Also the emulator is fast and easy to setup and use and debugging to the phone is also painless. The main page is showing the month summary for the site and you also got a previous/next arrow there for moving to stats for other months. If you swipe to the "day" page you will get some day by day stats. 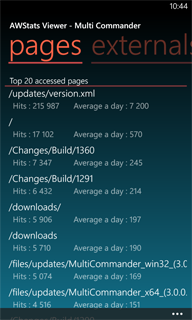 The "pages" page will show the top 20 accessed pages and how many hits it has and it will also calculate a day average. And the last page show "externals" this is top 20 external links to your sites. More stats pages are planed like browser and OS stats. But I have not had the time to add that yet. Under the ... menu you get command to refresh current stats and you can also go to the "sites" page where you configure what site it can access and the URL for it. The site summary command will fetch months stats for the entire year and show a month by month stats. and if you press the ... menu on that page you can request to fetch even more and get previous year and so on. All this "old" stats will be saved and cached in the phone so it will only fetch them once. Under settings you can configure the live tile. Activate if it should update the tiles in the background, what information from what site it should show. Multiple live tiles are supported. Live tiles of all sizes are support. There is still some things to add and fix. Adding Browser and OS stats is one thing. and if possible I would like to add a domain (country) stats. Also some minor thing need to be fixed. But I will wait with adding them and run this for a couple of month and see what else I want to add. Also I have a lot of work planed for my other projects, So I do not have more time at the moment to spend on this. The app is not available on the Windows Phone Store yet, And I'm not sure it will be. Also the demand for an app like this is very limited. Only web master that run AWStats and that owns a Windows Phone 8. I think I can count all of them on one hand. This app has been a great learning project for me. But I will try to release it if I get the time. If you are interested in this app let me know and I might actually put some time into finishing it.